So, we’re at the annual Clan Donald Craft Fair down at Armadale in Sleat on Saturday and Sunday, the largest event of its type on Skye. Sleat is the south-western ‘arm’ of Skye, so that’s a 100 mile round trip each day… We’re in marquee B if you’re around. Then on Monday, just for relaxation, we’re at the Craft Fayre [sic] in Waternish. 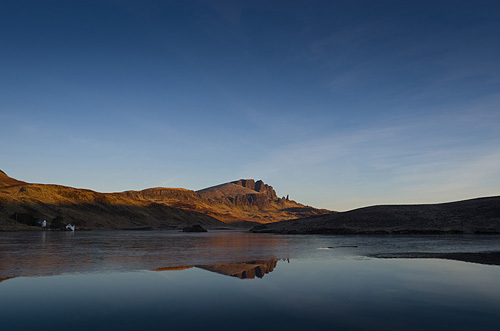 Don’t forget to visit our Zenfolio gallery to see the full range of images available to order. Handsome beast am I not? If you visit the OldByreSkye stall you can buy my portrait. McMoo. There’s a lot of waste wood around the property at the moment, some left over from the work on the annex, some from the ongoing work on the garage, and some from old fencing that was dumped behind the garage. It’s a good supply of kindling for the woodburner but I have designs on some of it – I need a larger workbench for the studio for which I’ve started to cut wood. But today’s project was a different bench – a bench seat for outside the house. 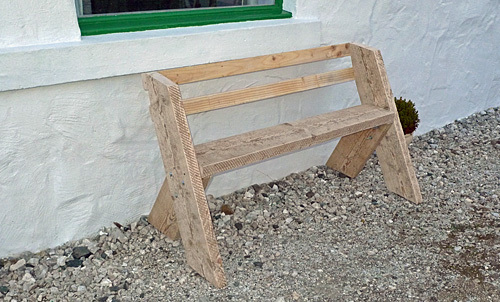 I’ve been designing a simple bench in my mind for years, for the leftover wood from the deck I built years ago back in Greenford but never got around to building it. It’s a more practical life up here on Skye, so I set to work yesterday sorting out timber to experiment with. I did, however, have one disappointment. 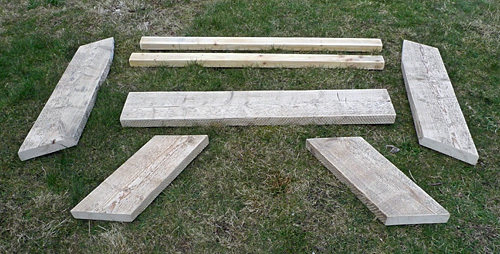 Out of interest I did an online search for bench plans and found that my fledgling design already existed. Not only did it exist but it even had a name: it’s an Aldo Leopold bench. No, me neither. But perhaps I should have. Leopold, it turns out, was an early player in the American environmental and wilderness conservation movement, becoming professor at the University of Wisconsin. Here’s a quote from A Sand County Almanac, a collection of his writing published shortly after his death in 1948. “… a land ethic changes the role of Homo sapiens from conqueror of the land-community to plain member and citizen of it. It implies respect for his fellow-members, and also respect for the community as such.” And amen to that. By a happy co-incidence with my discovery of Aldo Leopold we also recently discovered that 2013 is The Year of Natural Scotland [don’t know how I missed that!]. The more observant of returning readers may have noticed that I’ve added their logo to the blog’s banner. Anyway, back to the bench. It’s a very simple design that can be made from a few lengths of solid timber [the original spec seems to be 8″ x 2″ by enough to finish] a few screws and coach bolts: all things that have been found lying around rural properties for generations. It’s true to the original conservation ethos that the timber has been reclaimed. Unfortunately I couldn’t reclaim quite enough 8 x 2 so the back is made from two pieces of 3 x 2, which gives it a lighter look, although weakens it a little. There’s a very slight lateral wobble [although no worse than many commercial garden benches! ], so I may make a few tweaks – maybe a stretcher on the rear legs. We have had a gap in our lives this past week. A big gap. 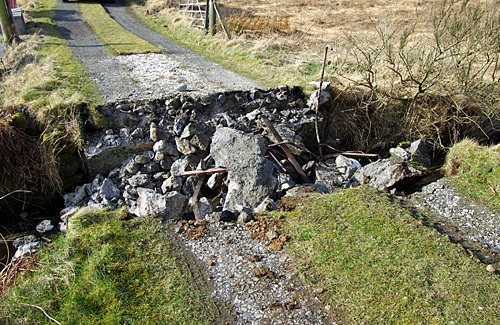 A big gap where the bridge across the Allt a’ Mhulaig (the burn that runs across the front of the property) used to be. As part of the work to convert the garage into the cafe/gallery we have had to replace the bridge, as the builders didn’t think it could be trusted to bear the weight of the cement and aggregate delivery lorries given that we didn’t know exactly how it was constructed, other than that it appeared to be a cast concrete slab sitting on concrete piers. So, in short order, it was demolished. 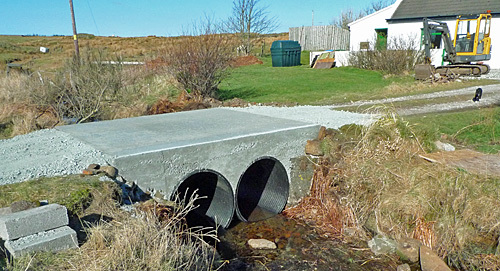 As you can see, the new bridge is formed from culvert piping with concrete on top. What you can’t see are the two steel girders sitting on the piers a lorry axle’s width apart, and the steel reinforcing mesh that was missing in the old bridge. In due course we will think about putting up some form of side rails, when the rest of the building work is done, and we are landscaping. 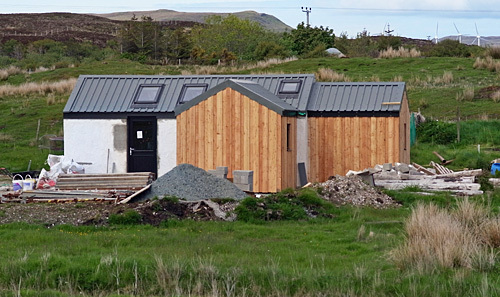 Today is the first anniversary of our taking possession of The Old Byre – the official start of our time on Skye. It was a day not unlike today; cool, dry (thank goodness! ), mainly cloudy. So how to summarise the first year? Well, read the rest of the blog – I wasn’t just talking to myself you know! But here’s how things stand now. We had hoped to have the apartment ready for the back-end of the 2012 summer season, but that didn’t happen until October. But we’re pleased with the results, and bookings are coming on – May is completely booked-out already. We had hoped to have the cafe/gallery open just after Easter so we could start at a quiet time and grow into it. Now we’re probably looking at around June. If we can achieve that we would not only hit the high season, but also hit the ground running (running (running all over the place). There are still things in boxes, mainly the nine boxes of books under the stairs – at some point we’ll get around to putting up shelves or units there. As it’s clear that I won’t have working space (only storage) in the gallery I need to do a proper conversion of the spare bedroom into a working studio, which means the bed will have to go and I’ll build a larger workbench (I’ll have plenty of spare wood out of the garage!) As the garage has had to be emptied, chiefly into a shipping container in Portree and the recycling centre, I’ll be putting up a new shed in the back garden. It’s just arrived so I’m sure it will get its own blog post sometime! There’s new vegetable beds to be dug this spring, and hopefully the polytunnel will go up this summer. I haven’t yet got out as much as I had hoped, but that’s all part of getting used to living somewhere new, with a complete change of lifestyle, and all the practical setting up to do. There’s always something to be done somewhere inside or out, so I’m not sure how we will fit in work! 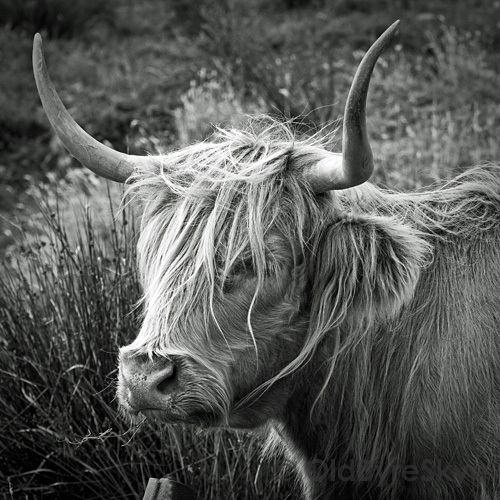 Currently listening to: Affric – Duncan Chisholm. Divine Scottish fiddle playing – traditional with a contemporary twist. Season’s greetings to all who follow the OldByreSkye blog, follow a link to it, or just blunder across it. 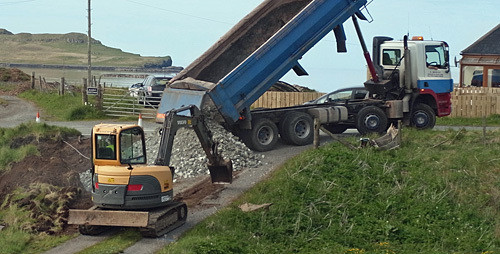 What the hell are they doing in Staffin? The night sky on Skye is a joy to behold on those occasional clear nights, an astronomer’s paradise. If you look up the milky way (our home galaxy, seen edge on) is clearly visible drifting across the 3000 or so stars that might be seen unaided*. What got me started on this is that NASA recently released new images of the earth at night (the so-called ‘black marble’), composites of cloud-free night images of the earth taken by the Suomi NPP satellite. I’ve downloaded the ‘big’ image, the Google earth version, and very nice they are too. Here’s the extract covering Skye, slightly enhanced. You can clearly see the bright light of Portree in the centre, and the lesser lights of Broadford and Kyleachin lower down. We’re not far from the fuzzy blob that is Dunvegan (and you can take that description how you will!) All is as you would expect. However (there’s always a however – although preferably not at the beginning of a sentence!) when The Guardian (along with other newspapers) published the global image as a centre spread on 7 December it had a few detail images, including the UK, that were not drawn from the ‘Black Marble’ set, and actually date from 27 March. The quality isn’t as good, but the brightest light on Skye seems to be coming from Staffin. Staffin is a small village, yet in this image is almost as bright as Inverness, the ‘capital of the Highlands’ on the extreme right. So what the hell are they doing up there?? Yes, things have been quiet again on the blog front, but we have been busy elsewhere, with finishing the let and being assailed by visitors. The big news is that the buildng work and decoration for the annex has been finished (except the stair carpet which I will lay this week). The work has been signed of by Building Control at the Highland Council, so its all legal, and we have signed up with a local booking agent, so it should be on the market next week, hopefully. “Adjacent to the owner’s traditional, croft house home, this newly renovated apartment provides contemporary cottage living for up to two adults. It is completely self-contained and enjoys its own private entrance and parking area. “The spacious open plan lounge and has been well planned and equipped, creating the perfect sociable space in which to lounge and relax. The furnishings and fittings are of a high standard throughout, and are complemented with little touches of island culture. Large lounge windows allow sunlight to stream in on sunny days, and the wood-burner effect electric stove creates a cosy hideaway whatever the season. 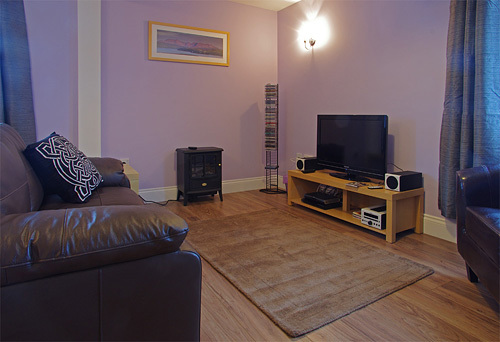 “The apartment retains many of its traditional features, but offers guests all the modern comforts of home with Wi-Fi, i-Pod docking stations and a large flat screen HD television. There is also a DVD player and a selection of CDs, DVDs books and games for you to enjoy. 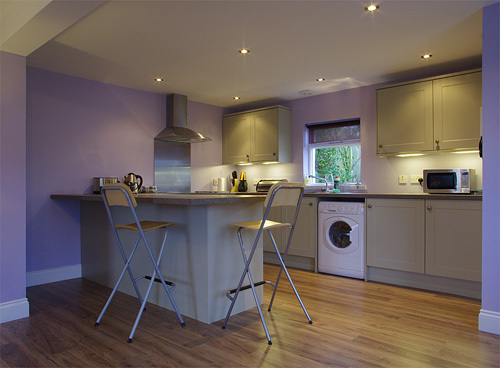 “The kitchen-diner is situated at the far end of the lounge area and is fully equipped with ceramic hob and oven, microwave, fridge freezer, dish washer, washer/drier and loads of cupboard space full of quality crockery and utensils. As soon as it is available at the booking agent, I’ll post the link. Lounge area – “the perfect sociable space in which to lounge and relax”. We say so, so it must be true! So, as I promised to name names, many thanks to Brian and Sean and all at Altree Joinery, who turned up when agreed, completed the job on time, in budget and to an excellent standard. Yes, we are talking about builders here!. A special shout-out to Jimmy the painter/decorator who provides a superb finish and a full run-down of island politics! *It’s actually Imperial Mauve 5, which sounds more like a race horse than a paint colour. Or possibly a social scientist. In the mid-1980s, Demos wonk David Ashworth, in a fit of post-modernist idealism (or supreme narcissism), changed his name to Perri 6.